The development of Missouris mule and jackstock industries continued into the 1840s. Dr. A. W. Rollins, Nathaniel Leonard, and David M. Hickman were Missouris leading jackstock breeders. Cooper and Boone counties were the leading jackstock counties in Missouri. At the same time, Eli Bass of Ashland in southern Boone County became one of the best-known mule breeders. Over the years, it was estimated that he produced more mules than anyone else did at that time. 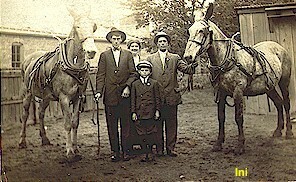 His son, William H. Bass, later became a noted jack and mule breeder. By the late 1830s the first real documented foreign imported mules arrived in New Orleans via the small island of Malta in the Mediterranean Sea. As mules began to make more of an appearance in central Missouri agriculture, so did the reports of their sale in newspapers. The mules and jennies were selling for much more than the normal purchasing power of the dollar as compared to other agricultural products. By the 1840's, some mid-Missouri counties were beginning to organize their first county fairs. Jack and mule competitions were held at many of them. Although the first such county fair had probably been held in Columbia in 1835, it was several years before other counties started organizing similar events. In 1841, a county fair was held in Boone County. There were so many jacks, jennets and mules that four judges were used. They included Hugh Withers of Monroe, Major McKenny of Callaway, Harrison Elliot of Howard, Nathaniel Leonard of Cooper, and Wm. Maupin of Boone. Each was a recognized mule or jack breeder. Most of the winners at this fair were sired by Don Quixote. Stud services of jacks was being advertised by the 1840's. For example, Pendleton Lusk and Jacob Johnston offered the services of their "premium jack", Maximus, for the price of $15. By the 1850's large number of mules were being produced in Missouri. For example, in 1851, Eli Bass of Boone County offered 100 mules for sale. In 1854, Jacob and Irwin Maddox of Fulton had reportedly sold 100 yearling mules to N. L. Lindsay of Bourbon County, Kentucky for $10,000. Some mules were quite large. Mules were merchandised in various ways. In 1852, a mule show and sale was held on the public square in Paris, MO. About 600 mules sold that day. One lot of 154 two-year-old mules brought $86 per head. Some Missouri mules were quite large. For example, Robert W. Sinclair, of Monroe County sold a mule for $400 that measured 16.3 hands and weighed 1,460 pounds. The mule had been a prize winner at the State Fair. As the number of the animals increased within the state, owners began to sell their stock outside of the state. By the middle of the century most of the animals transported on the Ohio, Missouri, and Mississippi Rivers were made up of mules/jennies. The mule trade mainly took place in the states of Tennessee and Kentucky. Before long, they were selling their stock in the Ohio River Valley and the cotton producing states of the South. Many central Missouri counties fostered the growth/popularity of mules in the state. These counties included Howard, Callaway, Boone, Audrain, Saline, Carroll, and Lafayette. The three that produced the most mules were Callaway, Boone, and Howard. This boom continued through the 1850s until the Civil War broke out. This page was designed by Patrick Eslinger and Lyndon Irwin.